There is a lot of news flying around the Internet now about how gossypin was recently discovered to inhibit human melanoma cell proliferation in melanoma cell lines where two genetic mutations occur. This exciting research also discovered that in lab tests using cell cultures, gossypin inhibited the growth of human melanoma cells and reduced tumour volume while increasing survival rate. This study was published in the American Association for Cancer Research. In addition, gossypin has been reported to exhibit anti-inflammatory action. So typical of the Internet, there is now a plethora of blogs out there praising gossypin without knowing much about it or what plants can we find this in. Gossypin is a bioflavonoid that occurs naturally in several plants that belong to the Malvaceae family. It is also a glucoside and is known to have antioxidant properties. The Malvaceae (or mallow) family is large. They are a family of flowing plants that contain over 200 genera with almost 2,300 species. This includes the Malva, Althea, Hoheria and Hibiscus. The more commonly known members of this family include cacao, okra and cotton. In addition to hibiscus, other flowers that are edible that contain gossypin include hollyhocks and the Rose of Sharon. Now let’s move onto what wild edibles in the Malvaceae family. 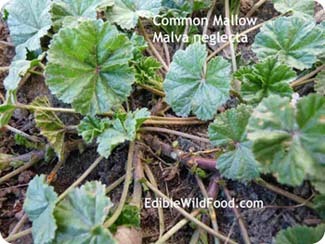 Many parts of the world have some type of mallow growing in their area. The mallow plant grows naturally in Europe, Asia, Northern Africa, the Americas, and Australia. Most mallows have been used over the centuries as food or as medicine. The leaves, roots, and flowers are edible. The leaves of mallow are collected in spring, and the herb’s flowers can be collected in the summer. Mallows are beneficial for healing and relieving the pain of cuts, scrapes, stings, boils, and bruises. Healing ointments have been made for centuries using fresh leaves and roots. Be sure to add edible wild mallows on your list of wild foods to enjoy this year! Hi. What would be the best way to get gossypin? Hibiscus tea? I had a 1b malanoma removed a couple weeks ago, so I’d really like to start taking this, but want to make sure I’m getting a good amount. The blog answers your question! Hi, just curious, did you rake the tea? How are you doing? My 21 year old daughter was recently diagnosed. I want her to start, too. Thank you! I did not have cancer. I am so sorry to hear about your daughter. Please research this topic thoroughly. Email me at [email protected] and I can give you many credible links to check out. Start with this though… https://thetruthaboutcancer.com/ If that was my daughter I would recommend eat NO processed foods and stay away from dairy, red meat and sugar as well as acidic foods… that will be a great start.